This is a color pencil drawing I did for a good friend of mine for Christmas. 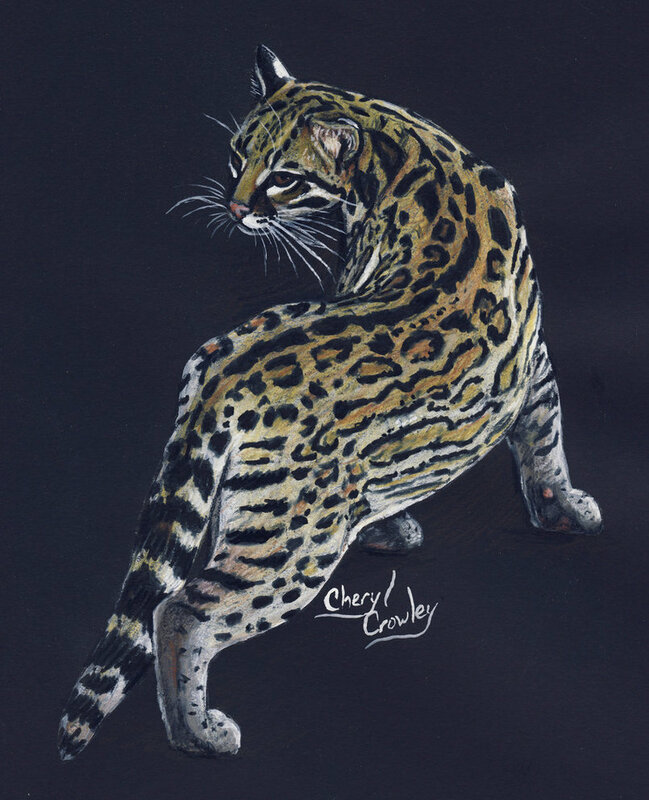 It is an ocolet cat, a wild cat of Central and South America. This is one of his favorite kinds of wild cat. This was drawn from a photograph I took of the male ocolet at the San Diego Zoo. To bring him out from the dark paper I first used white gouache paint for the highlights and then after it dried I used color pencil over it. That is my trick to popping out the animals on dark backgrounds when using color pencil, otherwise it would take a lot of elbow grease to bring it out, which I really do not want to do! This is so beautiful. I haven’t tried colored pencil and now I’m inspired. Your white gouache trick is brilliant! Wht is white gouache? How does it work? gouache is a type of paint, kind of like watercolor, but opaque. It is often used for wildlife painting and the white gouache is often used with watercolor. Incredible, you are so talented. Love ocelots..